The only adults associated with the Bulls and the DBAP last night were 1) those who never came in the first place or 2) those who left early. In what kind of world does it make sense to start a baseball game at 10:00 pm at night? Who is making these decisions? And why? And this on a day (night) when all concerned have to hit the road, the Bulls up to Columbus, Ohio and the Mud Hens to Norfolk? For non-local readers, yesterday evening the tarp was on the field at 7 pm as a series of thunderstorms moved through the area. Not a lot of people showed up for the game, even though the “paid attendance” numbers were at 9,027. After a 2:52 delay, the 3:08 hour game was played. In round numbers, that means starting the game at 10:00 pm and finishing it at 1:00 am. That is so late that even the local paper, the Herald-Sun doesn’t have an on-line article. Even a nutcase like myself gave up following the game through streaming about 11:00pm. So essentially all except a very few truly dedicated fans (or dedicated beer drinkers) missed a thrilling 6th inning. That thrilling inning is sort of my point. In what kind of world do we have 18 professional athletes play a game at midnight with nobody watching? And why should they? Who makes these decisions? Whoever “they” were it’s time they are called out. That was a really dumb decision. You should be ashamed of yourselves. We fans love watching baseball. 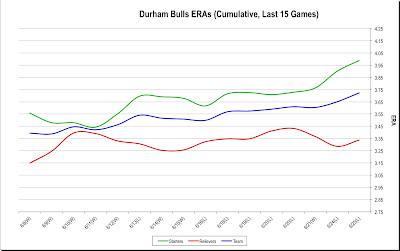 The Bulls depart town after what was the worst home stand in recent memory, winning only one out of seven games and dropping from first place in the International League South Division to third place. What happened? Well terrible starting pitching was certainly a factor. Dylan Floro had two miserable starts. Rehabbing Matt Moore may have pleased the Rays with his progress, but he still lost the game. Young Robert Zarate, who had only started a few games in his career came up from A-ball and actually had the best start of the bunch, but still lost the game. The chart shows the ugly drift upwards in the starters' ERA over the last week. What’s missing? Well, maybe who’s missing might be the better question. Matt Buschmann and Ronald Belisario come to mind. The season is half over and the turmoil down St Petersburg way has been extraordinary. The Bulls are off to play against the very teams that just beat their brains in, Columbus and Toledo. Will they get it back together? We’ll see.